Coverage: Live on BBC Radio Wales, BBC Radio Cymru & BBC Sport website and BBC Sport app, plus live text commentary. 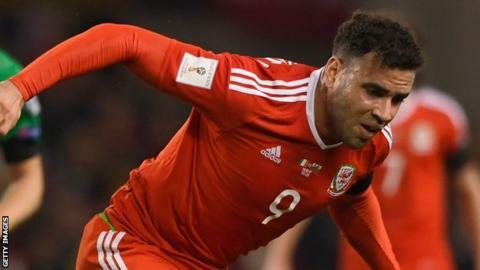 Hal Robson-Kanu says Wales have little room for error in their remaining 2018 World Cup qualifiers. Wales are third in their qualifying group after four consecutive draws, four points behind leaders Serbia with five games remaining. On Thursday manager Chris Coleman will name his squad for the qualifier against Serbia in Belgrade on 11 June. "It goes without saying how important it is," the West Bromwich Albion forward Robson-Kanu said. "We'll come together, be ready and try and get the result which we know we can. "In every competitive international game to have to try and get points and the one in the summer will be no different." Wales will hold a training camp at the Vale do Lobo resort in Portugal ahead of the qualifier in Serbia. Real Madrid forward Gareth Bale and Aston Villa defender Neil Taylor are suspended for the game. Liverpool youngsters Ben Woodburn and Harry Wilson are set to be included in the senior squad after being omitted from the Wales Under-20 squad at the Toulon Tournament. Everton defender Gethin Jones, who spent the second half of the 2016-17 season on loan at Championship side Barnsley, could also be named in the squad. The 21-year-old was born in Perth, Australia, and the Socceroos have been keen to bring the Porthmadog-raised youngster on board. Jones, who has captained Wales sides at various levels including the Under-21 side, turned down an invitation to join Australia's development squad camp in Spain in March.